Bankrupt Detroit asks a judge to forgive billions in debt payments. (Bloomberg) — Detroit, the biggest U.S. municipality in bankruptcy, challenged the legality of a series of financial transactions behind $1.44 billion in pension bonds and asked a judge to let it stop making the payments. The contracts, signed in 2005 and 2006, were a “sham” designed to circumvent a Michigan law capping how much debt cities could incur, the city said yesterday in a complaint filed in U.S. Bankruptcy Court in Detroit. Those contracts allowed two city service corporations to issue so-called certificates of participation to fund pensions for municipal workers. Detroit officials at the time decided the contracts didn’t need to be considered debt for purposes of the state cap, according to court papers. 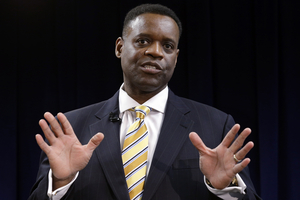 When Detroit’s emergency financial manager, Kevyn Orr, put the city into bankruptcy in July, he cited the pension debt and a related set of interest-rate swaps as contributing to the financial crisis. Detroit listed $18 billion in liabilities in its bankruptcy filing and said it could no longer meet its financial obligations and still provide basic services to the city’s 700,000 residents. Before filing the suit, Detroit had given Bank of America Corp. and UBS AG until yesterday to say how much they would accept to cancel the swaps connected to the pension debt, a person familiar with the talks said. Those swaps, originally designed to protect against rising interest rates, have cost taxpayers more than $200 million since 2009. U.S. Bankruptcy Judge Steven Rhodes last month rejected as too costly a proposal to pay $165 million to cancel the swaps and told the city to seek a better price. Without a new deal, the city would consider taking action to have the swaps declared illegal and to prevent the banks from seizing about $4.2 million in casino taxes held in a custodial account, said the person, who asked not to be identified because the talks are private. Under a draft debt-adjustment plan sent to creditors, Detroit would pay nothing to Bank of America and UBS. While the city said in the plan that it disputes the legitimacy of the swaps, it said it may set aside about $4.2 million a month in a reserve fund in case a court finds them legal. Orr said he may file a plan with the court early this month. Bill Halldin, a spokesman for Bank of America, declined to comment on the lawsuit. Megan Stinson, a spokeswoman for UBS, didn’t immediately respond to an e-mail seeking comment yesterday after regular business hours. The pension debt was issued in 2005 and 2006. The swaps were designed to protect against rising interest rates by requiring the banks to pay the city if rates climbed above a certain level. When rates fell, Detroit was required to make monthly payments. In 2009, the city was forced to directly assume the service corporations’ obligations under the swaps, “with further, disastrous financial consequences,” according to yesterday’s filing. Days before seeking bankruptcy protection, Detroit agreed to pay $230 million to cancel the swaps contracts, which were signed with Zurich-based UBS and SBS Financial Products Co. Merrill Lynch, a unit of Charlotte, North Carolina-based Bank of America, took over the SBS position in July. After the price was knocked down to $165 in December, it still failed to win court approval. Creditors led by bond insurer Syncora Guarantee Inc. opposed a settlement. The city didn’t prove it would lose if it sued to cancel the swaps contracts instead of settling with the banks, Syncora said. The case is City of Detroit v. Detroit General Retirement System Service Corp., 14-04112, U.S. Bankruptcy Court, Eastern District of Michigan (Detroit). The bankruptcy is In re City of Detroit, 13-53846, in the same court.